What do you remember about how you were cast? I knew Michael got a pilot and was thrilled for him, but really did not know too much about it until they had cast another actress in the role of Kimberly, and apparently were not happy with her after the read-through. I got a call to go in and read and was immediately cast. I had done a few sitcoms but my résumé was mostly drama shows. I played a lot of prostitutes. This was a bit of departure for me, but Michael and I knew each other so it felt comfortable and did not take long to "find the character." Playing stupid is harder than you think. I have done it on camera only three times; most of the time it comes naturally in real life. Chris Hebert (s1, 2): I first was hired for the 1982 (?) Christmas show. I remember it being a typical audition experience, with an initial audition and maybe a callback. I hadn't heard of the show as it was still brand new. For the follow-up Christmas show the next year, I didn't have to audition; they just hired me directly through my agent. It was great to return as young Alex P. Keaton as everyone remembered me, and that made me feel very welcome as a young actor. Lisa Lucas (s1): I was quite successful at that point. Two of the movies I was in came out the same year, when I was 17. In 1977, I was voted Newcomer of the Year by the distributors, called "the Star of Tomorrow." I was sent to Kansas City to accept my award, my first black tie event. The Star of the Year was R2D2. They actually had him there and brought him on stage. I remember going to the Family Ties audition and there being a question about size. I'm small, 5'3". I could hear them speaking that they wanted somebody small for Michael. They had a big thing about my hair and they finally decided to curl it. My hair was straight and thin and long. It gave me too much height [compared to Michael J. Fox] so they had to comb down my curls. Terry Wills (s1, 2, 5, 6, 7): Not specifically. 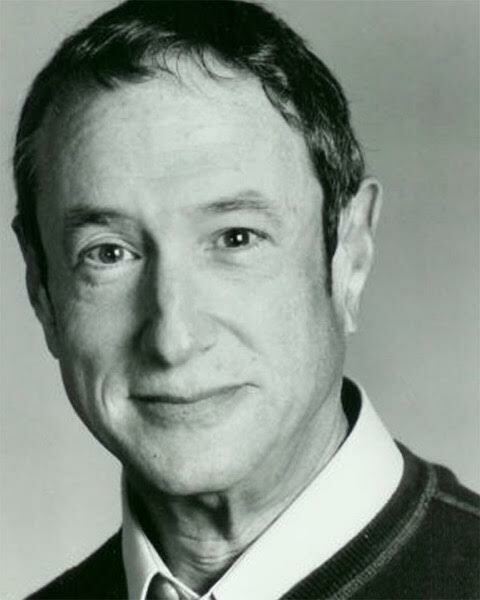 After I was cast I learned that Gary had been a fan of the Berkeley Repertory Theater when I was a company member there. I initially auditioned to play the part of their next-door neighbor, an architect. I did one episode as that character and he was never seen again. Kate Vernon (s2): It was probably my first or second audition. I read for Gary David Goldberg and was so green. I really didn't understand the auditioning process. Eileen Seeley (s2): It was my very first audition and subsequently the job I earned my SAG card with. I had just been brought out to L.A. by Bob Lemond, who had seen me perform in a Shakespeare class in the village in NYC. I was staying at Joey Travolta's house ([brother of] John Travolta, who was a client of Bob's) till I found a place to live. The morning of the audition, I was taking a walk around the neighborhood and was stopped by the police. Seems walking in Beverly Hills was very suspicious behavior! The audition was at Paramount and was very comfortable and casual. 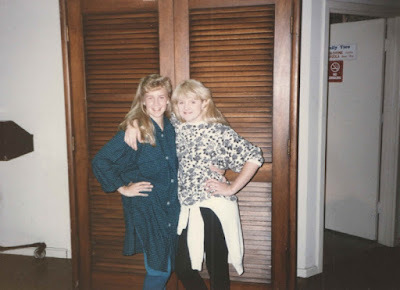 Debbie Gilbert (now Webb) (s2): It was my first audition ever. I picked up the sides [lines you must learn prior to an audition] ahead of time. I was given the chance to read only because Crispin Glover and I had the same agent. I was clueless about the show, and only knew that it was a sitcom so I had to be funny. Susan Isaacs (s2): I had participated in South Coast Repertory's Young People's Conservatory when I was in junior high school. Lee Shallat headed up the YPC at SCR. She was good friends with my high school drama teacher, Barbara Van Holt, who was the best teacher I ever had. They kept in touch, and Lee saw most of my shows in high school. Barbara and Lee were champions of me. I went on to study film at UCLA, but I kept getting cast in other students' projects. I visited Barbara over the Christmas break. She told me Lee was going to start directing TV and in fact was lined up to direct an episode of Family Ties sometime soon. I told Barbara I had just taken headshots. A few hours later, Barbara called my parents to tell me that Lee was directing Family Ties that coming week—could I come to [auditions at] Paramount the next day with a headshot and résumé? I drove up to L.A. and camped out at the photo lab to get a rush copy of my headshot, then went to Paramount. It must have been a producers' call, because everyone was in the room. Lee being there made me feel relaxed and confident. And maybe I was just so green that I didn't realize how big a deal it all was. My friend Paul Germain was in the graduate film program at UCLA when I was in the undergrad. He'd started to work for Jim Brooks, so I stopped by Brooks's office to say hello to Paul. Paul looked a little sad, thinking I was so naïve and about to get my heart broken. He was only half right. I did book the job. But acting is a heartbreaking business. 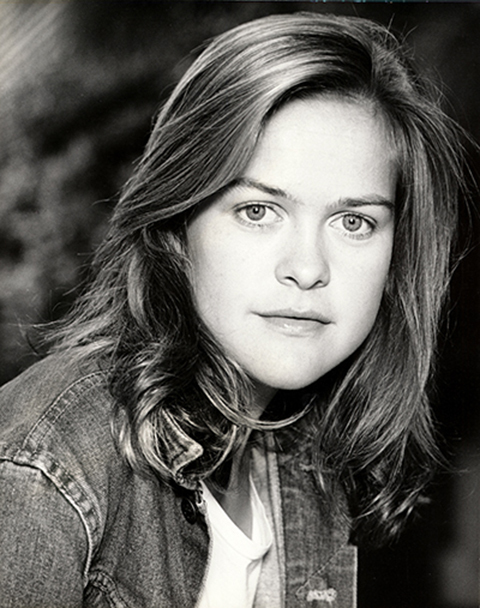 This is my very first headshot—the one that I took with me to the audition. Alan Blumenfeld (s2, 3, 4, 5, 6): I remember everything because that's the kind of Jew I am! 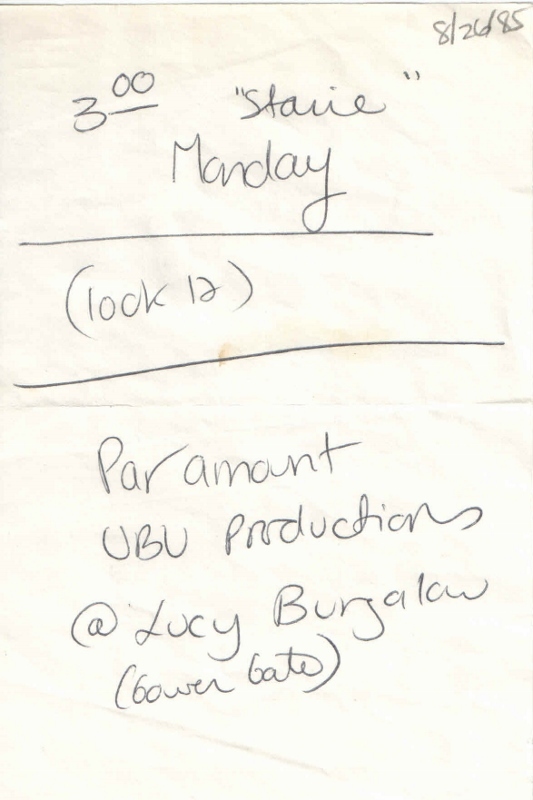 Gary had his office at the Lucy bungalow at Paramount, where Lucille Ball was when she was there. I was 31 and there with a number of older actors. It was to audition for the episode when Elyse sings in a club ("Lady Sings the Blues"). A lot of people had more experience. I'd been in L.A. for only a year and a half. I'd done only one or two shows. I knew Family Ties, of course. I was waiting in a beautiful little park in the quad and preparing the material. The script said "Lou laughs." I did that. Gary laughed hysterically. And I got the job. Gary's laugh was very genuine, very big, very broad—he would laugh that way at every reading, every run-through. It was his way of punctuating where the laughs were and [supporting] the actors. From that first laugh, I felt a real kinship for him for all the years after. I'm convinced it was that laugh that got me the job. Robert Costanzo (s3, 4, 5, 6): As I recall, Gary just offered it to me. I did The Last Resort for Gary in 1979—I used to joke with him that it was one of the few shows he did that didn't make it. Gary and I had been friends from that. Later I did Brooklyn Bridge. There are some producers who won't bring you back but Gary did with me. I was on NCIS in 2005 or '06 and kept hearing I couldn't go back on because I already did one. On The Honeymooners, an actor named George Petrie appeared multiple times in different roles. I became the George Petrie of Family Ties. 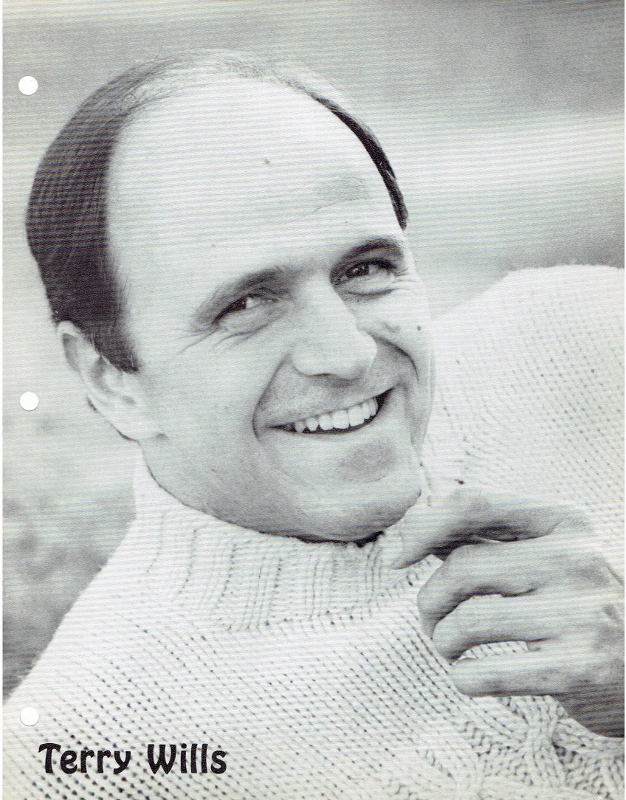 Norman Parker (s3, 5, 6): I recall reading for—or maybe even with—Gary as he sat behind his desk in his office at Paramount. I had not seen the show and knew nothing about it really as my focus had been on theater and film in New York and I was in L.A. at my agent's urging to put in some time prospecting here. It never occurred to me that the role of Robert Keaton [Steven's brother] would be anything more than a one-shot guest appearance, or, indeed, that becoming a Keaton was any kind of a big deal. Thankfully, Gary had much more foresight and, despite my easy-to-discern uncertainty about even wanting to do a sitcom, let my agent know they wanted me for the role. I had liked Gary so much and we had both been so delighted to discover we had played basketball for rival high schools in Brooklyn that I told my agent I felt I should probably take the job. She laughed hysterically and said something like "Oh, you think so?!" Clearly, everyone else had a great deal more perspective as to what becoming a Keaton might mean, for which I have been ever grateful. Peter Scolari (s4): I was at Newhart at the time and we had new writers/producers there. I had an acquaintance named Michael Weithorn, a writer/producer on Family Ties. He wrote the episode I appeared in. I think he had written the role for me. Michael called me at home [to ask if I would do it], so we must've known each other through mutual friends. He was so gracious. I loved the script and was happy to do it.Family Ties was at NBC, Newhart at CBS. They were quite insular and protective in those days. For example, if you were an actor on a CBS show, it was tricky to get a booking on The Tonight Show [on NBC]. [I did Family Ties on a week off from Newhart, but even still], the producers on Newhart were not thrilled with this. Margaret Nagle (s5): There was an episode of Family Ties in the fall of 1986 called "Starting Over." Alex is heartbroken because Ellen has left and his sisters try to find him a new girlfriend. I read several times to play Alex's new girlfriend. I was brand new to L.A. and had never been on a TV show before. Allison Jones, the casting director of Family Ties, who [went on to be] the casting director of many shows like Curb Your Enthusiasm and big movies, had brought me in and seemed to really like my work. The final audition went really well and I even brought these glasses and put them on in the middle of the audition. I will never forget how hard I made Gary David Goldberg laugh. He was so shocked and burst out laughing. He hugged me when I left the room. I knew it had gone well. My agent called and said I had the part and the show would make a formal offer tomorrow. I waited the next day for the call that said the part was officially mine. The phone didn't ring. At the last minute, the actress Haviland Morris, who had been in Sixteen Candles, became available. They thought she was hotter. I was so upset. But that's showbiz and you move on. A few months later my agent called and said "Can you get over to Paramount right now? Family Ties just called and they're giving you a small part. No audition. You're cast. Gary David Goldberg asked for you." Brian McNamara (s5): Unfortunately my memory of certain details will not be great. I do remember being very excited about the audition as Family Ties was already a very popular show! One that I personally loved! Sonia Curtis (s5, 6): I had auditioned to play Michael J. Fox's girlfriend and did not get that role, but I really, really wanted to work on that show. It was my fave show at the time. 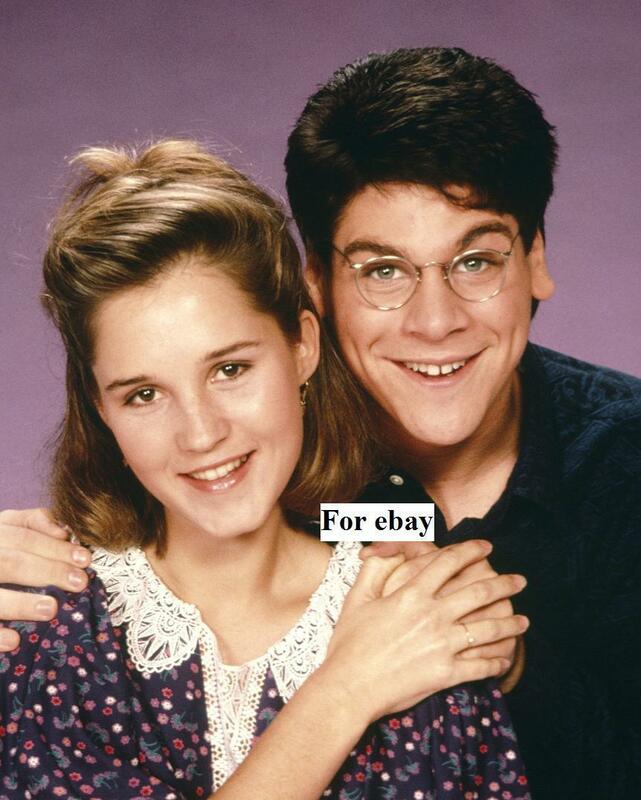 I remember thinking that Skippy wasn't the kind of guy I usually dated, so I went shopping and tried to find some quirky clothes to create the Amy Sussman character and find out who the girl who fell head over heels for Skippy was. I found the clear glasses I wore on the show and wore a Leave It to Beaver T-shirt, a big gingham plaid skirt, and a ponytail. I also worked on my voice and realized she was probably very socially awkward, so I let my own nerves free and just experimented with a more nasal voice and shy, slightly spastic movements. I worked on the lines all night long and was very tired for my audition. I remember walking in fully dressed in character. Allison Jones, the casting director, was on the phone when I arrived. As soon as she saw me, she enthusiastically waved me in the room. It seemed she saw something she had been looking for. She asked me to come back later that afternoon for the producers and I did. When I was finished, I thanked them and started to walk out, but the producers stopped me short to continue talking to me. Gary David Goldberg and Alan Uger were very nice and asked where I grew up, etc. 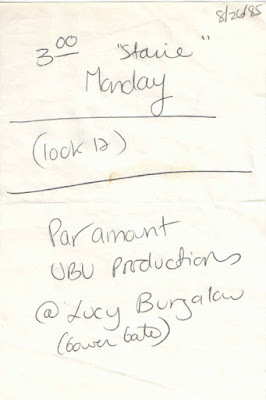 I got the call later that day or the next that I booked the role and it was quite exciting. Stuart Pankin (s5): It was a fun audition. I remember trying to be loud and obnoxious and funny, as the character required. They laughed a lot, thank God, and I got the job. Dana Andersen Schreiner (s5): I had auditioned for Allison Jones, the casting director, numerous times on different projects, so she liked me. She brought me in directly for the producers of Family Ties many times for different roles before I got cast. The producers brought me in four times alone to read for the role of Ellen, whom Tracy Pollan eventually played, and seemed close to casting me, so I was pretty devastated when I didn't get it. Amy Lynne (s5): I was born in 1970 so I was about 16. I was doing quite a bit of TV at the time. Of course it was the show, the biggest hit, because of Michael J. Fox. The part that I was auditioning for actually wasn't named Chrissy, just another friend. Gary David Goldberg had a big presence. When I did the funny lines, he had this distinct laugh. It made me want to laugh, too, but I was trying to keep my composure. I remember getting into the car with my mom after and she always asked how I did. I remember the first thing I said was "At least I made him laugh." I remember being in the frozen food aisle at the Vons market in Glendale when I found out I got the part. I'm wondering how my mom found out when we were in the market. I might've borrowed a dime and called home to check the message machine. I was so ecstatic, I was almost crying. At the first read-through, they liked me so much they changed my name to Chrissy, the friend Jennifer always talked about. Of course Michael and Meredith were the stars of the show; Justine got quite a few shows, too, because she was pretty in puberty. I think they wanted to highlight Jennifer more so they made my part bigger. Alyson Croft (s5): I remember the callback, the room being packed with executives and a ton of laughter. I was reading for the "leader of the cool girls" (can't remember the character name). They ended up booking me to be "one of the pack" (can't remember my character name). I remember feeling so excited after the callback. I had never made a whole room erupt with laughter, and up until that point I had no idea that I could. This was a big audition for me. I was only 11 or so and they were looking for older girls for the part. There was so much laughter after every one of my lines; I was inexperienced and didn't know I should hold for the laugh. This show taught me that skill for sure. I remember praying that I would get the part and we would hear something that night. In those days we had no cell phone or beepers so we had to wait through traffic to get home. I remember driving over Laurel Canyon that night and at the Franklyn Canyon intersection a cat had been hit and was dying in the middle of the road. I was hysterical and crying the whole ride home. I remember not getting the call that I had booked the job and I was devastated. Two days later my agent called and said that I had booked a different role on Family Ties. I was elated! Originally it was supposed to be one episode and it turned out being more. I remember these details because I was so young, I was huge fan of the show, and it was the first big show I had booked. Jason Naylor (s6, 7): Quite unusually for her, then or now, my mother—without whose indefatigable support I would never have had the opportunity to make a career in the industry nor to enjoy the many fruits which that opportunity bore—had erred in noting down the time of the audition and we arrived some two hours late to the casting office on the Paramount lot. 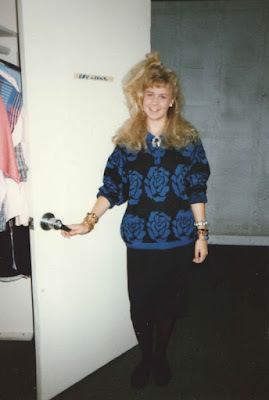 The office was abandoned but for the receptionist, who gave us a withering look when mom made bold to announce us, with due civility and apologies for our unconscionable tardiness, and to ask whether there was anyone there who would see me at all. She excused herself to go check and, returning, announced that Mr. Goldberg would see me in a moment. That the producer of the show should have taken time to see an actor under those circumstances seems to me, in retrospect, quite incredible—that the ensuing audition could have gone so well as to land me the part, more so yet. After a time, Mr. Goldberg returned me to my mother and, in the most generous and courteous way imaginable, thanked us both for coming in. Hilary Shepard (s7): I was doing a play in L.A., Out in America, and we were getting a lot of attention. The playwright [Katie Ford] got hired at 21 years old to be a writer on Family Ties. She thought of me for the part which was quite a leap—I went from playing a 7-year-old idiot savant (in the play) to a Eurotrash supermodel. When I went to audition, the producers couldn't believe I was the same girl. Did you think/hope you would come back to play your Family Ties role again? Peter Scolari (s4): Sure. It would've been a difficult arrangement given my status at Newhart. Jason Naylor (s6, 7): I was not initially cast as a recurring character, so far as I recall, though the idea was mentioned a time or two during the production. I didn't give it too much weight at the time, already being well aware that an industry deal isn't done until it is (and sometimes not even then), but was delighted and gratified to be brought back. I don't have many memories of the cast members or production crew, but I have always had great fortune in my work experiences, which have almost exclusively involved eminently talented, respectful and professional actors and crew members, and my two appearances on Family Ties were no exception. I fondly recall the warm welcome I received upon returning to the set for the second time.